Final price: $2.43, only .70/lb! Not sure what the price of these is, but take the price of 6 and divide it by 12, which is what you'll get. My buy price for sweet corn is .20-.24 per ear. Final price: $3.72, only .47 each! Final price: .49 each when you buy 3! I just had the chance to get to Cash Wise last night. Thank goodness for friends and cashiers that make shopping trips that last til 12:30 AM so much fun! Found: Lee & Perrins "Try Me Free" hangtags on the Classic Thick Worcestershire sauce! Perfect because it was on my list and I didn't have any coupons! Final price: As low as .44 each! Pay as little as $2.20, receive a $3.50 Catalina! Final price: $1.30 Money Maker for the 5 boxes! Final price: $1.20 for all 5 boxes! Well, it's another exciting weekend to buy the paper. We are expecting 3 inserts this weekend: a Smart Source, a RedPlum and a Proctor and Gamble insert. 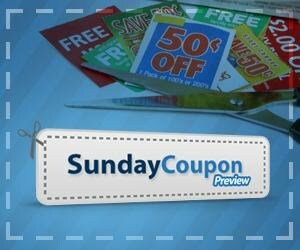 Too many awesome coupons to list here, so head over to the Sunday Coupon Preview to see a full list! People ask me all the time if it's worth the cost, and I always say "Yes!" I use a lot of internet printable coupons, but nothing compares to a nice thick insert of coupons from the paper. 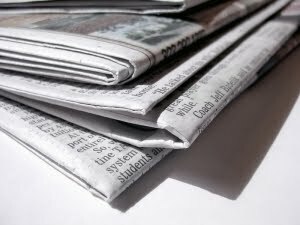 I buy at least 2 papers per week, sometimes 4. A week when we get 3 inserts is especially worth it in my eyes! In our area, I recommend the Star Tribune as it carries a higher volume of coupons than local papers. My guess is that today's has the SmartSource, but not all 3 inserts, but it's worth looking if you're out, as today's paper only costs .75 as opposed to $2 tomorrow! Next week no inserts are scheduled, as it is a holiday weekend. Fun and Free Around Today! American Family is hosting a Customer Appreciation and Safety Awareness Day TODAY at their office at 2829 University Drive in Fargo! This event is free and open to anyone! This sounds like a blast, I'm hoping I can make it over there with my daughter! Games to Go bouncy toys and free food and drinks for everyone. 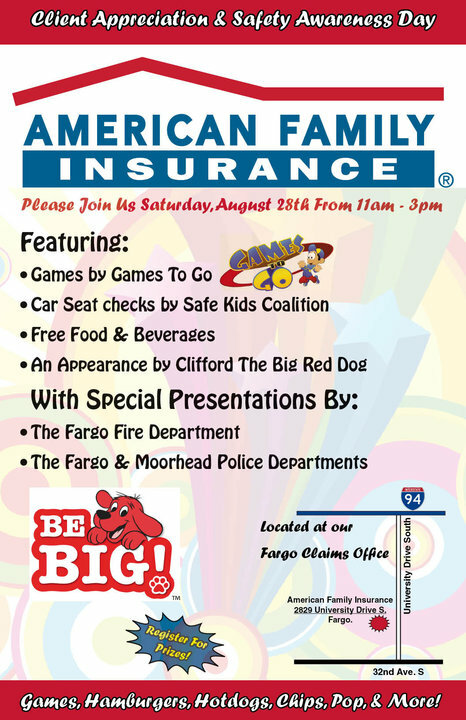 There will be an appearance by Clifford the Big Red Dog, The Moorhead and Fargo Police Departments and the Fargo Fire Department. Plus, I'm big on this one: free car seat safety checks! Please take advantage of this if you have a little one! This event is today, Saturday from 11-3 on South University in Fargo. Wow, this is the weekend to remember for Restaurant Coupons! This time it's Chili's. Get a FREE appetizer when you sign up for Chili's Email Club! Plus, right now you'll also get the option to register a card and get a coupon for a FREE Brownie Sundae after you sign up as well! Collin over at Hip2Save also got a welcome email after she signed up with yet another coupon for a FREE appetizer with the purchase of any entree. Wow! Thanks, Hip2Save! Retail Deals + New Local Restaurant Coupons! I've got a handful of retail and restaurant coupons for you. There are a few expiring quickly, so here you go! You can score $10 off a $25 purchase at JCPenny through Saturday with this coupon! Use this coupon to score 30% your purchase at Gap, Old Navy and Banana Republic through Sunday! Plus, they donate 5% to Big Brothers Big Sisters! ...and receive 25% off a new one the day that you trade it in. Personally I think their prices are on the high side, so I don't know that I'd find the best deal, but if you've had your eye on something there, you may as well get 25% off! Use this coupon at Duane's House of Pizza to get your second pizza half off when you buy one! 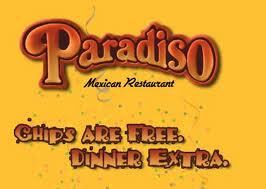 Sign up for the Paradiso VIP Club here and receive a coupon for a FREE Flan dessert! Quizno's is at it again! Use this coupon to score a Small sandwich, chips and a drink for only $2.99! And, last but not least, use this coupon to get one entree 50% off when you buy another at T.G.I. Fridays! FREE Cinna Stix at Domino's + HOT Qdoba Coupons! Collin over at Hip2Save has the details on how to get a FREE order of Cinna Stix when you place any online order at Domino's.com! For the details, head over here! 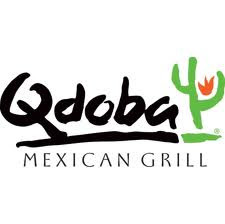 Are you a Qdoba fan like me? Actually, I LOVE Qdoba. If so, head over here to "build a boredom beating burrito" and snag a coupon! You can play once per day through October 1st! The coupons vary, and are only good for 2 days from when you receive it. Yesterday my husband and I both got "Buy a drink, get an Entree FREE!" Yeah baby! The two of us ate awesome meals for only $3.18 total! And, no dishes were dirtied in the process. :) Others have reported getting 50% off your Entree, BOGO Entree and more. 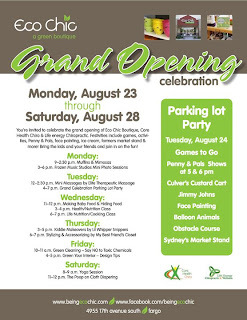 Fun and Free Around Town this Week! Moorhead RiverArts is tonight at Moorhead's Davy and Memorial Park! From 5:30-8:30 tonight, there will be free fun events for the kiddos and the rest of us, too! Last time around, there were food vendors, bouncy house games, and a farmer's market as well. Plus, the weather is gorgeous! EcoChic Boutique at 4955 17th Ave S in Fargo! Click on the image to see a larger version. 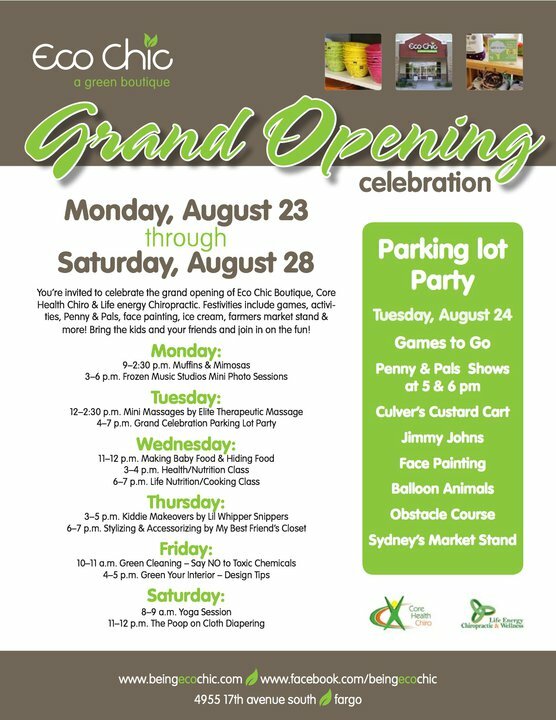 There are some pretty fun looking activities going on all week, but tonight there is a Parking Lot party from 4:00 - 7:00 PM! Thanks, On The Minds of Moms! Be sure to check out the Island Park Craft Show this weekend! 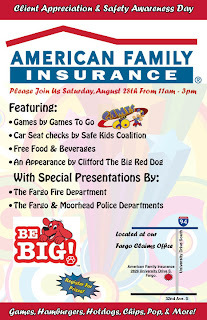 Sunday August 29th is Fargo Moorhead's Street's Alive! Event! 5 miles of streets surrounding downtown, Island Park, Woodlawn Park and Oak Grove Park will be closed off to motorized traffic from Noon-5:00 PM to encourage you to walk, bike, run, stroll or otherwise get out there. I'm actually pretty excited about this, because one of the roads being blocked off is mine. I think it will be neat to watch the action from our house! find Street's Alive on Facebook as well! It's Cash Wise's turn for the General Mills promo we've seen at Sunmart and Hornbacher's. Save $5 when you buy 10 advertised General Mills products in one transaction with Cash Wise in-store coupon. Prices below are based on sale prices minus .50 per item from the Cash Wise coupon when you buy 10. Note that many General Mills coupons state "Do Not Double" and so it may depend on your cashier whether your coupon doubles or not. Final price: .25 after coupons! Final price: as low as .25 each when you buy 2! Final price: As low as .18 each after coupons! I haven't confirmed that this Catalina is running at Cash Wise, but look for signage advertising this. If you receive anything, please let me know! FREE Subscriptions: Taste of Home and Rachael Ray! This is a nice little surprise to start the morning! This kind of offer will not last, so hurry, hurry hurry if you're interested! 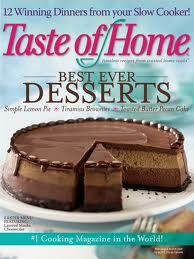 Would you like a FREE 1 year subscription to Rachael Ray Magazine and Taste of Home Magazine? Head on over to Common Sense With Money to get the scoop! Remember the Kellogg's Catalina I told you about last week? There are still some deals to be had this week. The catalina was advertised in last week's ad to run through 8/28. Purchase 10 or more Kellogg's products in one transaction, get a $10 catalina good on your next order. Pay $10, receive a $10 catalina back! Receive a $10 Catalina coupon! Final price: $3 for all 10 cereals! Final price: as low as .49! Full General Mills Promo matchups coming after Sunmart Deals are posted this morning! Note: You should be able to stack these because one is a Manufacturer's coupon and one is a Cash Wise coupon. Some cashiers have not allowed it for me in the past, just FYI. Final price: $2.49 each when you buy 2! Note: Since this is a Manufacturer's coupon, it should be redeemable anywhere, so if you find a better price at Walmart for example, you could use it there. I think we will see a better sale price before this coupon expires. If you don't need frozen pizzas this week, you might hold on to your coupon! Hey all, I've canceled the Get Together + Coupon Swap scheduled for tomorrow night, Tuesday the 23rd. There's a combination of reasons, but Moorhead RiverArts was rescheduled for tomorrow, and my family enjoys going. In addition, I didn't have any RSVP's yet. I realize there may have still been a few of you planning to come, so I apologize! On that note, let's go ahead and get September on the schedule! Saturday, September 25th from 9:00 - 11:00 AM. RSVP here or just email me at fmcheapskate at gmail dot com if you're not on Facebook! 7 Up Products, 2 Liter .88! Hornbacher's Half Gallon Ice Cream $1.68! Great news! There is one insert scheduled this weekend, a SmartSource. Why is this great news? After many weeks of buying the Star Tribune on Sunday to get all the coupon inserts, it's likely that today you'll be able to find the SmartSource in the Saturday Star Tribune! For only $0.75, yeah! I say that because typically the Saturday Star has carried the SmartSource every week. Come back and let us know. I'll be busy today manning another HUGE garage sale (come out and buy things!). Come back and let us know what you find - good luck! For the full preview, check out the Sunday Coupon Preview! Groupon Deal: $25 for $50 at the Gap! I'm jumping on the Groupon bandwagon today! Today only Groupon is offering a can't miss deal: $25 for a $50 gift certificate to use at The Gap! And, this comes just in time for Back to School shopping! Choose your city (Fargo isn't an option, but Minneapolis is) or a city near you. The Gap offer should be available in most cities today. After you purchase, you'll receive your voucher to use as soon as tomorrow! Limit 1/person. Valid in-store at US and Canada Gap stores only. Not valid @ Gap Outlet, Factory, Generation, online. Not valid for GiftCards, tax, or w/other offers. $50 minimum purchase. View complete terms. Hurry, this freebie never lasts long! Head over here to request a FREE copy of the KraftMaid Idea book for your home! I love bringing you fun and free ideas for ways to get out in the community, whether that's a night out or a family event. I'd really love to make this post a regular weekly part of FM Cheapskate! And in order to do so, I need your help! Have an idea for a fun and free (or cheap) event going on around town? I'd love for you to email me at fmcheapskate @ gmail . com (take out the spaces)! When possible, please email me a link for more information as well. I have received a lot of positive feedback on this posts, so thanks in advance! Tomorrow, Wednesday August 18th from 6:30-8:30 at the FargoDome, NDSU Athletics is hosting Bison Fan Day to kick off the fall NDSU sports season! The event is free and open to the public. The 2010 football, volleyball and soccer teams will be signing autographs and taking pictures. In addition, there will be inflatable games from Games Galore, posters, prizes, schedules and 500 yard signs available for fans. Kids can also sign up for the Erbert and Gerbert's Junior Bison Club. Movie in the Park Tonight: Toy Story! The Fargo Parks District is hosting a Free Movie Night tonight at Island Park! Tonight's FREE movie is Toy Story and the movie starts at sunset (according to the flyer, around 9:15). To make a free event even better, there will be free popcorn and Pepsi while supplies last! Take a lawn chair or blanket and enjoy! Final price: $5 for all 10 items, or only .50 each! Final price: .50 off each! Final price: $1.25 each when you buy 2! Final price: $6 for all 10 items, only .60 each! Receive a $3 Catalina coupon to use on your next purchase! Final price: .50 money-maker on 10 cans! This is a chance to make great use of the combination of store promotions, coupons, and Catalina promotions either for your family or to benefit others! Time to stock up for winter! Even if your family won't eat all 10 cans, I'm sure that most of us have easy access to the 5 coupons you'd need to come out ahead and still leave the store with 10 cans of soup. If you don't have a place that you regularly donate to, look for the Emergency Food Pantry bins by the doors at most grocery stores. Final price: FREE! You might want to make sure you have an extra item to absorb the .02 overage, as well! Final price after catalina: .98 each! FREE 8x10 Photo Today only at Walgreens! Walgreen's is having 7 Days of Photo Deals this week, and today's deal is a FREE 8x10 Photo! Limit 1 per online account, this deal is available online only, then you pick up the print in-store. When you click here to order, the $2.99 should come off automatically in your cart. If it doesn't, use promo code: FREE_8×10_DEAL. How beautiful is the cooler weather this weekend? I've got a great idea for you if you'd like to get out and enjoy it this afternoon. I know my family plans to! The 16th Annual "Jass Festival" is this afternoon in Moorhead's Davy Memorial Park, just north of Main on 8th St from 4:00-5:30 PM. The weather looks great and best of all, this event is absolutely FREE! There will be 3 shorter performances: a Jazz Combo, Vocal Jazz and a Big Band performance, all by young area musicians. Head on out and enjoy! Look for 2 coupon inserts this weekend in the Star Tribune, a Red Plum and a SmartSource. Today's Star Tribune only has the SmartSource, so look for both inserts tomorrow in the Sunday paper! And many more! For the full preview, head over to the Sunday Coupon Preview! Last Minute Get-Together + Coupon Swap Tomorrow Morning! I'm feeling a little dense, I posted this yesterday over at FM Cheapskate's Facebook page, but forgot to post it here on the blog! It's a bit last minute, but if you're able to, come on out tomorrow morning to West Acres and meet some fellow coupon friends and swap coupons if you'd like. We'll find a corner of the food court from 9-11 tomorrow morning, and you can feel free to come and go if you need to. On Facebook? Let me know if you plan to attend! I've really enjoyed these in the past. There's no serious agenda. A few times there's been a dozen people clipping and swapping, and once there were just 3 of us, more interested in chatting and sharing tips than swapping coupons. It is really for you! Can't make it tomorrow? Pencil in Tuesday, Augst 24th from 6-8. We'll do it again for those of you that prefer weeknights. Well, just as suspected, Hornbacher's is running a General Mills promo similar to the General Mills promo at Sunmart this week. There are several more items included in the Hornbacher's version, but to get the $5 savings, you need to use a Hornbacher's in-ad coupon. There is wording on the coupon that states "no other coupons can be used with it," but several readers have been allowed to use Manufacturer's coupons with the in-ad coupon already. I'd either ask at the front desk before you shop (since it may vary depending on the manager on duty) or just know that it's possible a cashier could refuse your in-ad or Manufacturer's coupon based on the wording. Save $5 with in-ad Hornbacher's in-ad coupon when you buy 10 participating General Mills products. Prices below reflect the .50 savings per item you'll receive from the $5 coupon. Final price: .48 for both! Final price: .25 each after coupons! Final price: .18 each after coupons! Final price: as low as .48 after coupons! Final price: .48 after coupons! Sunmart General Mills Promo just got Even Sweeter! It was a pretty good General Mills promo to begin with, but things just got a little more exciting at Sunmart this week! As I reported in the Sunmart Weekly Deals, you can get a pretty good deal on lots of General Mills items this week by combining sale prices, coupons and an instant savings promotion. Add in a few Catalina deals and the deals get even sweeter! Here are 2 Catalina Deals running at Sunmart through 9/5. I was able to confirm these tonight at Sunmart. Thanks again to the sweet gal I met at the Moorhead Sunmart who let me confirm by looking at her Catalina coupons! It was great to meet you! Updated: My faulty math has been updated. The deal is not a money maker but still a great price on these items! Thanks, Sarah! Final price: $4.40 for all 10 items, only .44 each! So, as you can imagine there are plenty of scenarios. You can mix and match these with other participating items as well. Come back and let us know how you made it work for you! Head over here to print a new Quizno's coupon for a FREE Sandwich when you Buy One with a Regular Fountain Drink! Last year I believe there was a rebate to match this, so stay tuned. We may see it again! Tis the season for great catalina promos, rebates and coupon books. Have you found any new coupon books around? Wow, a nice General Mills Promo to go along with all the GM coupons we received this weekend! Here's the gist: Buy 10 items, get $5 instantly at checkout. Buy 20, get $10 off instantly, buy 30, get $15 instantly. Basically, as long as you buy in quantities of 10, you'll be able to figure an instant discount of .50 per item. Obviously, this make for a better discount on lower priced items, but you can use Manufacturer's coupons with this deal, so many of the prices can be even sweeter than listed in the ad. Final price: .49 for both after doubled coupon and instant savings! Final price: .35 each after doubled coupon and instant savings! There is also a $2 off Ground Beef or Chicken when you buy 10 Con Agra products coupon in the Sunmart ad. I don't see any great sale prices or coupon match-ups to go with it. However, it is a Manufacturer's coupon good through 8/27, so hang on to it! I'm sure we'll see a good deal or some more coupons to go with it soon! Our Family Large Eggs, 18 ct .99!